TORONTO , March 20, 2019 /CNW/ - Continental Gold Inc. (TSX:CNL; OTCQX:CGOOF) ("Continental" or the "Company") is pleased to announce a positive mineral resource estimate for Broad Mineralized Zone 1 ("BMZ1") located in the central-west portion of the Yaraguá system at its 100%-owned Buriticá project in Antioquia, Colombia . All information incorporated for estimating the mineral resources for BMZ1 was derived from a recompilation of the block models used to calculate the global mineral resource estimate for the Buriticá project announced on January 30, 2019 . Combined Measured and Indicated mineral resource estimate of 828,870 tonnes at 14.15 g/t gold and 22.9 g/t silver for 377,000 ounces of gold and 611,000 ounces of silver. Inferred mineral resource estimate of 141,150 tonnes at 5.37 g/t gold and 12.1 g/t silver for 24,400 ounces of gold and 55,000 ounces of silver. BMZ1 is a high-grade, steeply plunging, pipe-like ore shoot related to the intersection of two vein systems and includes discreet veins as well as disseminated and vein stockwork materials (see Figure 1). BMZ1 has a vertical extent of 400 metres and ranges between 25 to 40 metres in width by 80 to 120 metres of lateral extent. 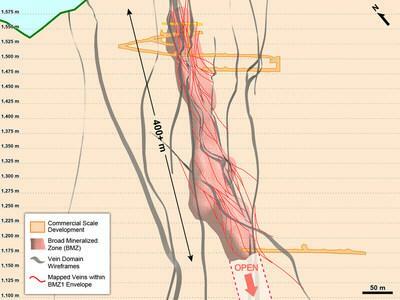 BMZ1 remains open at depth for expansion. Up to 10,000 metres of drilling specifically targeting BMZ1 is planned in 2019. "BMZ1 continues to expand and this initial mineral resource estimate highlights the potential of this zone to provide greater flexibility for mine planning and more ounces per vertical metre during production," stated Ari Sussman , CEO. "Our 2019 drilling focus is to define the broad mineralized zones identified to date ahead of planned commercial production in 2020." A total of 141 drill holes totaling 6,410 metres and 1,084 metres of underground channel sampling along development drifts were used in the estimate. All data was composited to the nominal sample length of 1.5 metres prior to analysis and estimation. Grade estimation was completed using Ordinary Kriging (OK) into 10x10x10-metre parent cells. Previous Mineral Resource estimation work for the Buriticá project separately reported vein and broad mineralized zone material located between the gold bearing vein domains. This mineral resource estimate for BMZ1 is simply a restatement of the block models, in a combined form, as derived from the mineral resource estimate for Buritica announced on January 30, 2019 . In the case of BMZ1 there is sufficient density of drilling and development sampling to combine a portion of the global BMZ Mineral Resource Estimate and the vein Mineral Resource Estimates and is presented as such below in Table 1. Mr. David J Reading, M.Sc., FIMMM, the special advisor to Continental and a Qualified Person as defined under Canadian National Instrument 43-101 ("NI 43-101"), oversaw and supported the combined Mineral Resource modelling and the geology reinterpretation work as outlined in this announcement. The BMZ1 resource blocks combined for this work were derived from the block models used in the Mineral Resource Estimate for Buriticá dated January 30, 2019 . Mr. Reading has reviewed and approved the technical information contained in this press release. Mr. Reading has over 35 years' experience in the mining industry covering all stages of mine development, including exploration, feasibility, financing, construction and operations. He has an MSc in Economic Geology and is a Fellow of the Institute of Materials, Minerals and Mining. For information on the Buriticá project, please refer to the technical report, prepared in accordance with NI 43‑101, entitled ""NI 43‐101 Buriticá Mineral Resource 2019‐01, Antioquia, Colombia " and dated March 18, 2019 with an effective date of January 30, 2019 , led by independent consultants Ivor Jones Pty Ltd. The technical report is available on SEDAR at www.sedar.com, on the OTCQX at www.otcmarkets.com and on the Company website at www.continentalgold.com.